...or developed a dreaded disease, or been traveling in a remote land somewhere in the world with no internet access! So I started with just the bottom of the window, figuring if it went south, at least the whole thing would not look awful. Plus, that would be the easiest surface to paint. Again, I'm still putting up moulding, but do you see the corbels underneath the cabinets? What do you think of them? I still have mixed feelings about these particular corbels...I got this idea from Angie, over at The Happy Homebody, who just added these to her kitchen this summer. Hers are a different style, but it's the same idea! Well, here's hoping that your weekend was wonderful and you're all rested up and ready for another week! :) Have a good night! you did a great job of that window...and i have to say you kitchen is looking gorgeous! Oh Jenni I absolutely LOVE how your kitchen is coming along!! LOVE the painted garden window....it looks 100% better..LOVE IT!!!! The green in the cabinets looks beautiful. I can't wait to see more, more, MORE! The garden window looks lovely! Good job Jenni! 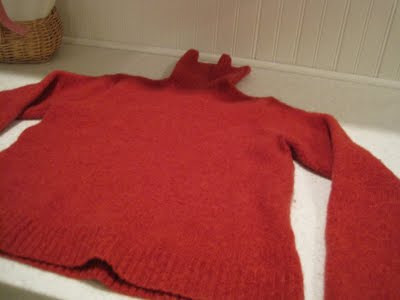 I can't wait to see how the sweater project turned out. Well I can wait, but I don't want to. It seems its all I do these days, wait, wait, wait, lol. Your kitchen is looking good...love the corbels that you installed on your top cabinets...they really add alot POP!!!! 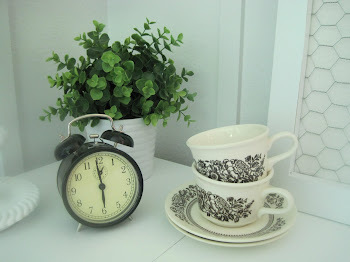 I'm working on my kitchen too...I'm taking a break for a few minutes...so what do I do?...BLOG!!!! The window looks GREAT! You did a wonderful job! Your window looks great! Might you decide to keep it now?? The kitchen is looking incredible!! I love that chandy there!! !